As Tsunami Debris Crosses Pacific, Dangers Emerge Western U.S. beaches are getting a regular dose of debris from the 2011 tsunami in Japan. The first few items were curiosities — a boat here, a soccer ball there. But as the litter accumulates, so does the potential threat of biological invasion. Beaches on the West Coast are getting a regular dose of debris from the 2011 tsunami in Japan. The first few items were curiosities — a boat here, a soccer ball there — but as the litter accumulates, officials such as Washington Gov. Chris Gregoire have acknowledged the scale of the problem. "We are in for a steady dribble of tsunami debris over the next few years, so any response by us must be well-planned — and it will be," she said. Beyond the obvious problem of litter, officials are on the lookout for hidden dangers. The tsunami swept an estimated 5 million tons of debris into the Pacific Ocean. Japanese scientists guess about 70 percent of that sank right away, which leaves maybe 1.5 million tons still floating around. "It's everywhere," says Carey Morishige, the Pacific Islands coordinator of the marine debris program at the National Oceanic and Atmospheric Administration. "It's spread out across nearly the entire Pacific Ocean." Morishige says the debris can't really be tracked from above — it's too hard to see. So her agency uses computer models to predict its movement. "All marine debris does not move the same," she says. "It depends on what the particular item is. If it sticks above the water quite a lot, winds tend to move the item faster." Those are the kinds of objects now littering the beaches at Ocean Shores, Wash. Bev Hughes has been picking up plastic bottles there. "I think they all clearly have Japanese writing on them," she says. Also on the beach is Lynn Albin, who works for the state. She's there to check debris with a Geiger counter that she holds up to the bottles. Radiation levels are normal, which is what state officials expected. Most of the radiation from the crippled Fukushima Dai-ichi nuclear plant was released after these objects were already swept out to sea. 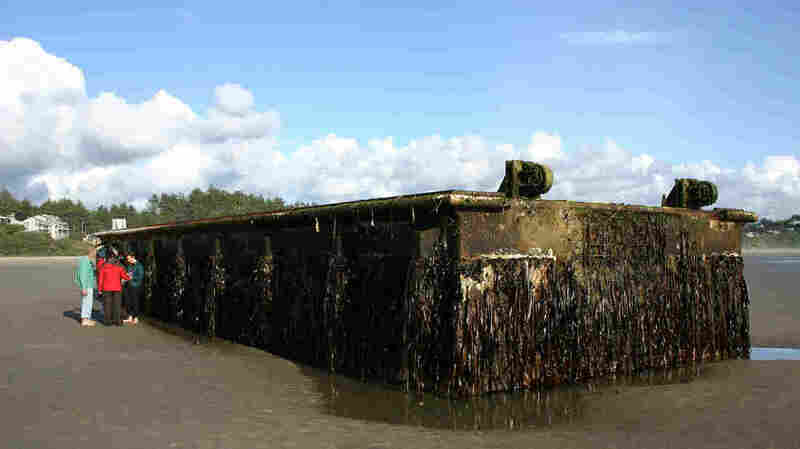 But some Japanese debris may carry another kind of threat: Earlier this month, a 65-foot-long floating dock washed up near Newport, Ore. It "felt like looking at a spaceship or something," says John Chapman, an Oregon State University biologist who specializes in invasive species. "It was an island that had drifted across from Asia." Among the dozens of species that hitched a ride, at least three are possible threats — a sea star, a Japanese shore crab and Undaria pinnatifida. Undaria is the edible seaweed found in Miso soup, but Chapman says if it started growing here, we might not be able to eat our way out of the problem. "If you have mountains of undaria, it's useless, right, it's bad!" he says. "You're playing roulette: Every time you're putting a species into a system, it could take over." People assume the ocean is a big mixing bowl — that species drift back and forth all the time. In reality, Chapman says, shoreline species usually don't find a way to get across the Pacific, but the combination of the tsunami and man-made objects such as docks and floats meant that Japanese species got a rare chance at a ride to the West Coast. Chapman says the result may be an unprecedented threat of biological invasion, one reason why Oregon officials decided not to take any chances with that dock. "The consensus of everyone, and I'm not sure where that started, was, 'Kill them as quick as you can, and as dead as possible,' " he says. "And so they scraped it down, and then they took blowtorches and burned the surface." Chapman says the torching may seem a little excessive, but he was "OK with it," given the risks.